Do you remember that line from Titanic, “A woman’s heart is a deep ocean of secrets.” A Small Indiscretion is a book that makes you dive into Annie’s ocean of secrets. It is the story of Annie, a 40-something year-old woman who lives you could say an uneventful normal family life and has it all, a loving husband (Jonathan), and three children: Robbie, Polly, and Clara, as well as a successful career. But you know what the say: no family is perfect. Annie’s life gets suddenly disrupted when a secret from her youth comes back to haunt her. And if that wasn’t enough to handle her son Robbie has an accident that leaves him in a comma. Needless to say, the life of her family is altered and forever changed. The premise is a good premise that calls for an emotional family drama. Even though I liked the story, I had trouble with the way the author chose to tell it. I didn’t enjoy the constant time jumps. I’ve enjoyed other books that use this format of having the reader go from past to present and vice versa. But I didn’t thoroughly enjoy it with this book. The book is divided into two parts. Part one didn’t do it for me. Instead of building up the conflict and making me feel totally engaged, it felt endless, boring and confusing. More about this on the full review on my blog. Part two was better than part one. In the end I was glad it all worked out, although without spoiling it for you, I felt like it would’ve been nice to know what happened when Annie met Robbie in detail, instead of leaving the reader to imagine it. 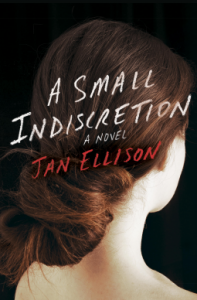 A Small Indiscretion is a likeable story. Even though I couldn’t relate to the characters or the “conflict”, I never felt like I wanted to DNF the book. On the contrary, despite the confusion from the first part, by the second part, I found myself wanting to know how the story ended. I don’t usually feel age affects the reading experience but with this book and how I couldn’t relate to the story that much, I feel like I would recommend it to anyone who is in Annie’s age group or who can identify with the stage in her life somehow. If you’re into stories about family secrets that are unexpectedly unveiled and how they affect everyone involved, this is the book for you. Book clubs might enjoy this story. I can see discussions about marriage, handling conflicts, infidelity, unexpected pregnancies and their effects, the impulsiveness of youth and its effect in your adult years, separation and its effects on children, etc., arise from this book.